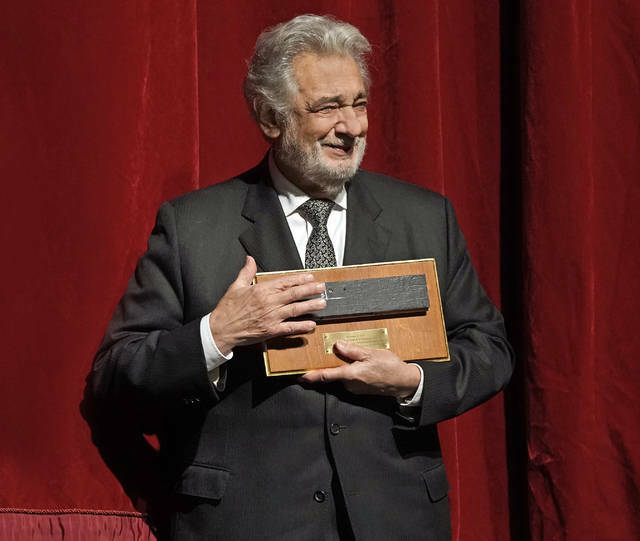 NEW YORK (AP) — Placido Domingo’s eyes watered and his voice quavered. After portraying dozens of characters over a half-century on the stage of the Metropolitan Opera House, he got emotional being himself. 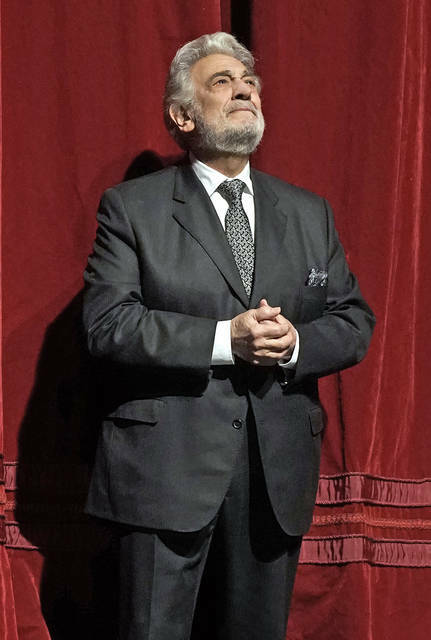 “For us, the opera singers, it is just like Frank Sinatra said: New York, New York, if you made it, you made it everywhere,” the 77-year-old singer from Spain said Friday night when he was honored on stage for the 50th anniversary of his Met debut. Domingo’s career with the Met started a few days ahead of schedule on Sept. 28, 1968, when he replaced an indisposed Franco Corelli as Maurizio in Cilea’s “Adriana Lecouvreur” with Renata Tebaldi in the title role and Fausto Cleva conducting. Domingo’s performance Friday in the title role of “Gianni Schicchi,” the third opera of Puccini’s “Il Trittico,” was his 52nd role and 695th appearance at the Met as a singer and conductor. During a ceremony after the opening opera, “Il Tabarro,” Met general manager Peter Gelb gave Domingo a pair of gifts. “Since you have owned this stage for your entire career, we thought we’d give you a piece of it. So this was removed from the stage earlier this week,” Gelb said before bestowing a chunk of flooring. Then he presented Domingo his leather jacket from a 1990s performance of Verdi’s “Otello,” which had been dipped in gold to mark the golden anniversary. “This puts you and Elvis in the same class,” Gelb said. Domingo’s wife Marta, son Alvaro and two grandchildren looked on as a montage of Domingo’s career was shown, including a scene from “Sesame Street” with Miss Piggy. “The generations go, go, go. I’m very happy to be surviving,” Domingo said. A few bouquets of flowers were thrown from the audience. A tenor for most of his life, Domingo switched to baritone parts about a decade ago. He has sung 150 roles, by his count. Domingo received a standing ovation of about 2 minutes when introduced. Four famous colleagues were recognized from the audience: Martina Arroyo, Sherrill Milnes, Teresa Stratas and James Morris. 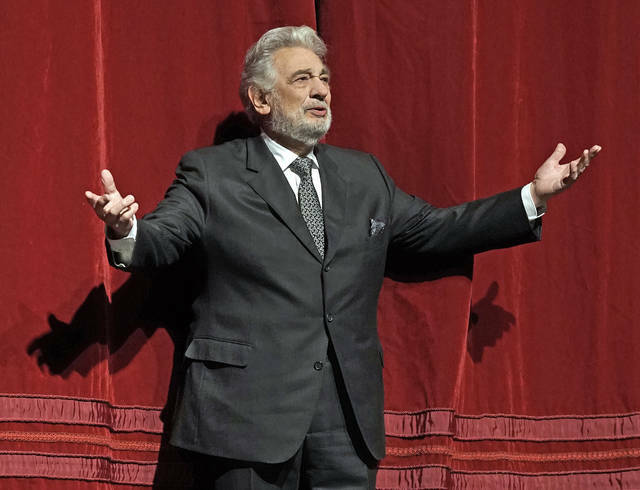 “I think Placido’s a miracle, and one of the most amazing parts of it is Marta,” Stratas said. Milnes first worked with Domingo in Guadalajara, Mexico, during Donizetti’s “Lucia di Lammermoor” and Rossini’s “Il Barbiere di Siviglia (The Barber of Seville). Domingo is known for indefatigable energy. Morris remembered making his Iago role debut at the Met opposite Domingo’s Otello in 1995.